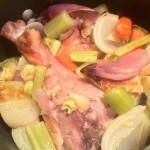 As everyone starts to get into holiday mode with Thanksgiving right around the corner, I thought now would be an appropriate time to do a post on an often overlooked and underutilized but so very important component of a successful Thanksgiving dinner: stock. Stock is the very first recipe we made in culinary school. Before you could move on to any other recipe, you had to master chicken, beef and vegetable stocks. I didn’t understand it at the time – in fact, it was quite infuriating. I was in culinary school, gosh darnit – I wanted to cook something! I was to be the next Emeril! They never make stock on the Food Network! Let me cook! Why am I spending days on some silly liquid that I will never use!?! Ahh, how foolish I was. Clearly, I didn’t understand the importance of stock back then, despite my culinary instructors’ insistence on it. Fortunately, I’ve gained some wisdom in the last 13 years since my first culinary school class. I now understand that many, many recipes start with good stock. 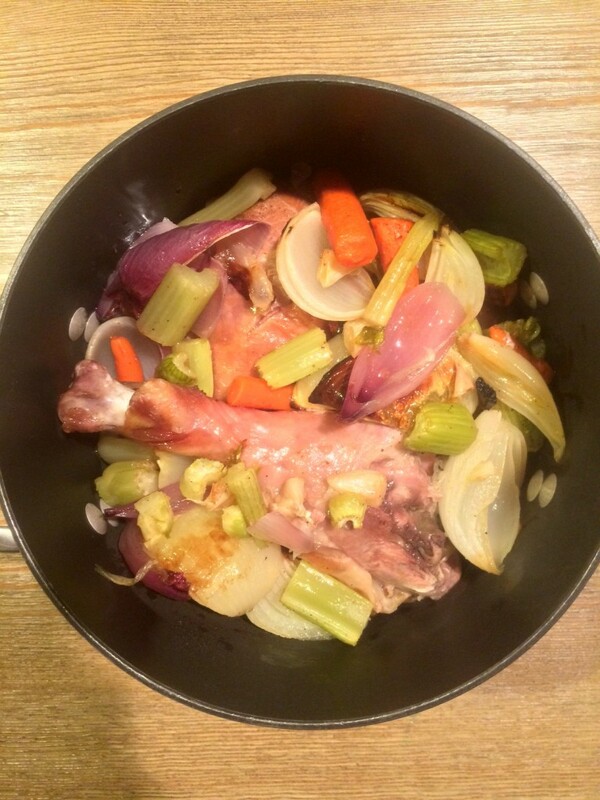 And I’ll admit – working full time and parenting 3 young boys doesn’t leave much room for homemade stock in my life. I often cheat and use store bought. But, for special occasions such as Thanksgiving, I like to take the time to make homemade. It will make a major flavor difference in whatever I put it in. 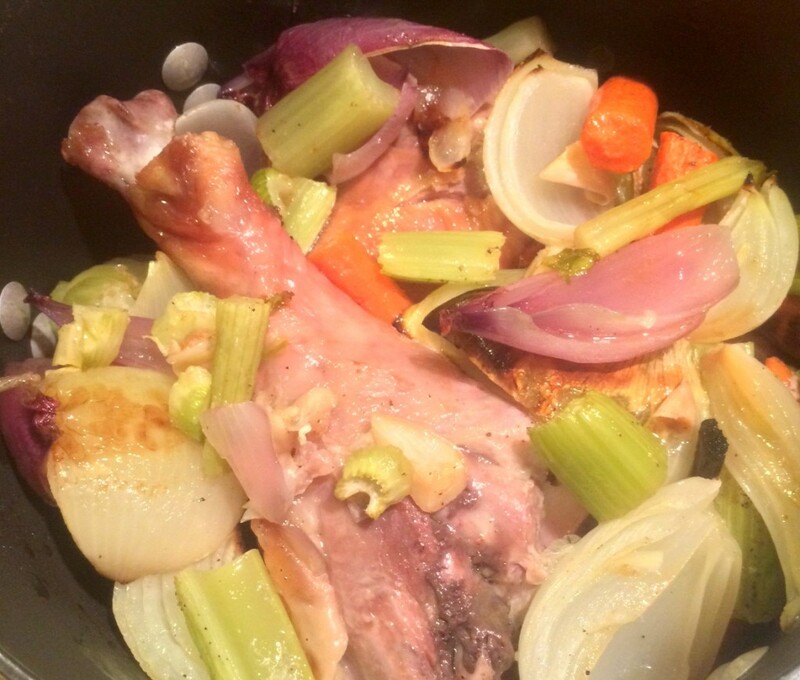 This year, I plan to use this turkey stock in my gravy, mashed potatoes, stuffing and for basting on my turkey. Think about that – four major components of Thanksgiving dinner all needing stock! So, learn from my mistakes and appreciate the importance of homemade stock and make a batch for Thanksgiving this year. It really is quite easy and fairly low maintenance. I made mine last week and froze it. You can do the same! It’s November 15 as I write this, which means you have 12 whole days before the big day is here! Give it a shot – you won’t regret it! Roasting the vegetables for an hour really concentrates their flavor and gives the stock great flavor depth. After roasting, dump everything into a pot and let simmer for 90 minutes. Spread turkey, carrots, onions, celery and garlic on a large sheet pan. Drizzle with oil and season with salt and pepper. Roast for one hour until vegetables are softened and skin on turkey is crispy. Place everything into a large pot, including any bits you scrape from the bottom of the sheet pan. Add thyme, peppercorns and bay l eaves to pot. Cover with water and simmer for 1 1/2 hours. Remove from heat and strain using a cheesecloth lined strainer. Let cool and refrigerate for up to 3 days or freeze for up to 3 months.